This Equipment is Really Nice!! 2 guns (Check the video). 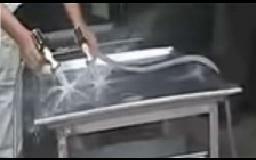 The machine can inject brine into meat load and shorten the curing time,improve the taste and yield of meat products. It is applicable to meat products such as ham, bacon, beef and poultry products and so on. 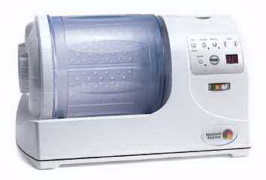 It is applicable to small processing enterprises and laboratories. 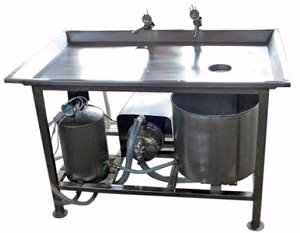 All in one - Stainless Steel Table, Stainless Steel Pump and Stainless Steel Resevoir and Pressure Tank included!! SAVE LOTS WHEN YOU BUY EVERYTHING COMPLETE!! 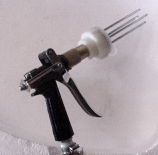 Needle for ProProcessor meat marinade injector (670796). Stainless steel 4" long w/ 8mm x 1.25 thread. Has 4 - 1.5 mm holes at end. THIS IS BIG! Needle measures 5.5"! 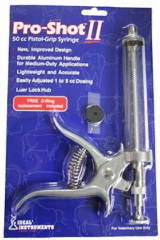 Uses same needle your animal health store will carry. 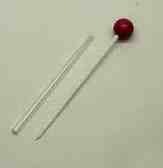 Marinate Needle #12 x 3"
Marinate Needle used to fit in the above injectors Item #600459, 600460 & 632032. 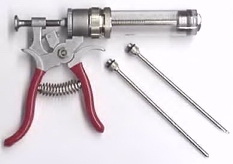 This injector is for large turkeys, roasts and hams and will inject up to 5.5 inches deep. 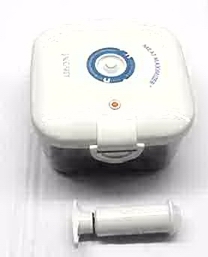 Includes a 3" needle with holes on opposite sides to maximize marinade distribution. Holds 2 ounces of marinade. Marinate chicken, turkey, roast, & more in just 1 minute! Use it over and over! The revolutionary Marinade Express tabletop vacuum tumbler gives cooking and marinade enthusiasts an exciting and natural way to improve your food preparation. MX Marinades deeply penetrate food in minutes, not hours. Food prepped in the appliance comes out much more tender, juicy, flavorful, fresher tasting and healthy. Other methods of marinating do not compare. You will want all your meats, flavored or unflavored, to take a fast ride on The Marinade Express before they arrive at the cooking station! Once there, meats will cook 20 to 30 % faster than normal, because of their increased juiciness. THIS MARINADER IS NO JOKE!! The vacuum seal opens the pores of the meat to allow the marinade to instataneously and thoroughly penetrate deep into your food from all sides. READY TO COOK WITHIN 5 MINUTES!! "INJECT-O-MAGIC" WILL INJECT SOLIDS INTO YOUR MEATS, NOT JUST LIQUIDS!! Need to flavor up that roast, turkey, chicken, ham, fish, potatoes, and almost anything else to the peak of perfection? "INJECT-O-MAGIC" may be used to inject garlic, spices, herbs, as well as peppers, onions, tomatoes, celery, parsley, pimento, cheeses, shrimp, bacon, and many others. JUST TRY IT, IT'S WONDERFUL!! Bon Appetit!! 60 cc. Syringe with large 3 inch needle that spices can get through.